Don’t need to spend a lot of money here since at the end of the event the car will be scrap metal (you might even make some money on the scrap). Entry fees are about $70 and to build the car can cost you anywhere from absolutely nothing to about a thousand dollars (if you’re the type who likes to Smokey Yunick everything you do). You’ll need a tow rig and trailer to get the heap to the event, or you can try to finagle a way to use your AAA card to convince a tow driver to get the car there. Safety equipment is almost non-existent. Use the stock lap belt, throw a boat gas tank in the back seat and secure it down with some chain. You can use any helmet (even Snell expired versions) so leave your HANS fitted/radio equipped/carbon fiber/Troy Lee Designs airbrush painted Bell helmet at home –you’ll only scratch it. I was dumb enough to bring my fireproof driver’s suit from I/O Port Racing Supplies (www.ioportracing.com). Yeah, they called me a pansy and told me to wear a t-shirt and a pair of jeans. 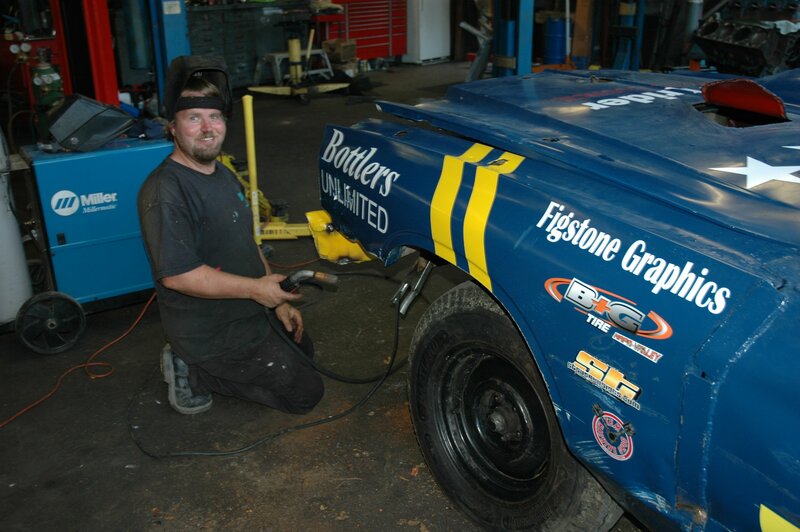 To set up the car, you’re going to need a friend with a welder. Buy this friend a lot of beer and keep him happy as he will be busy welding all of your car doors shut. I was lucky and had the guys at Third Street Auto Repair help me prep the car. They were the ones that suggested we weld the open differential into a solid axle (by welding the spider gears in place) for traction in the muddy arena. There are tons of sanctioning bodies in the hard hitting world of crash up derby. They seem to be organized county by county. 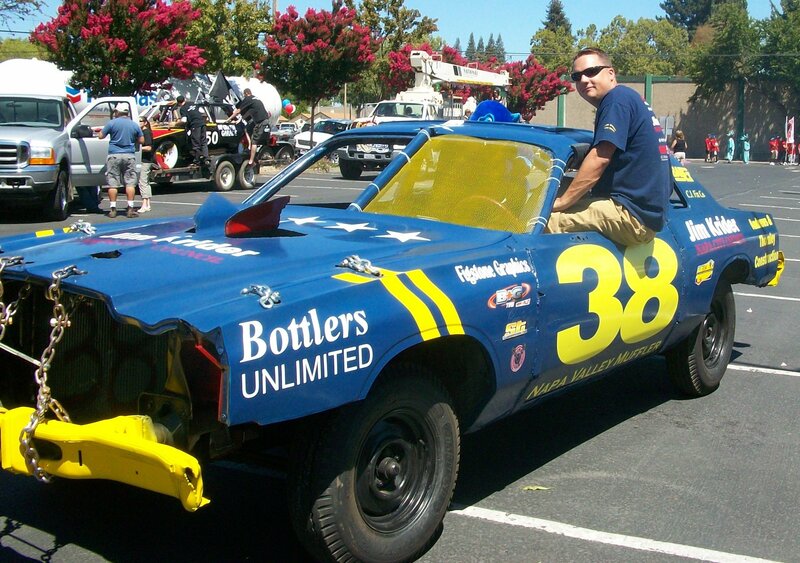 Dutch Holland Racing Promotions (www.dutchhollandracingpromotions.net) is one in Northern California. The rules between clubs change a little, for instance most clubs have outlawed the full frame Chrysler Imperial because it is absolutely indestructible. 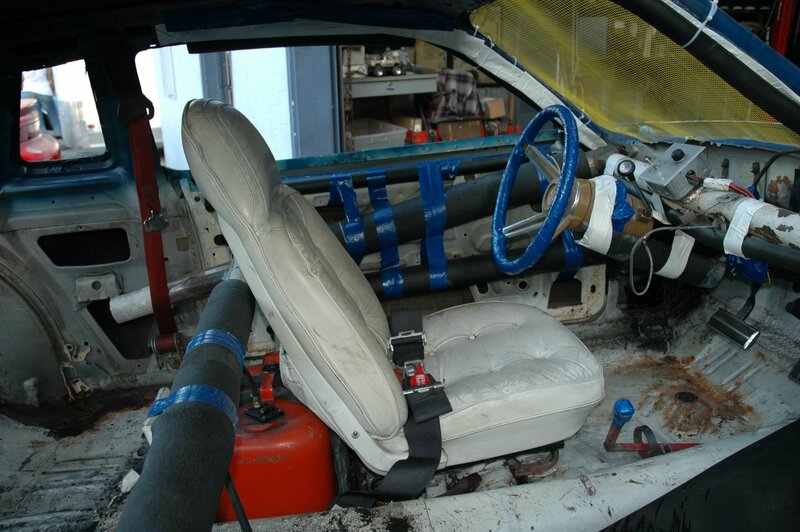 Some clubs allow you to weld in a flat square cage at about chest height (four bars, one behind seat, one for each door and one at the firewall). Most clubs want you to chain down your hood. American’s love their automobiles second only to seeing their automobiles crashed. If the best part of NASCAR is the crashes, then skip the Fig Newton commercials and the endless yellow flag laps and just watch cars crash for an hour straight at the demolition derby. Because of the crowd there is a real adrenaline rush to crash up derbies. It’s muddy, hard hitting, smash mouth football, only with Cordobas and Monte Carlos. The engine noise is awesome, the smoke and fire is considered beautiful. When you’re in the car and you’re hitting, it’s addictive. You’ve always wanted to hit that idiot on the freeway who cut you off. The derby is your chance to see what that feels like. Note: Just in case you weren’t sure, it hurts like hell. Junk. Absolute and total junk. 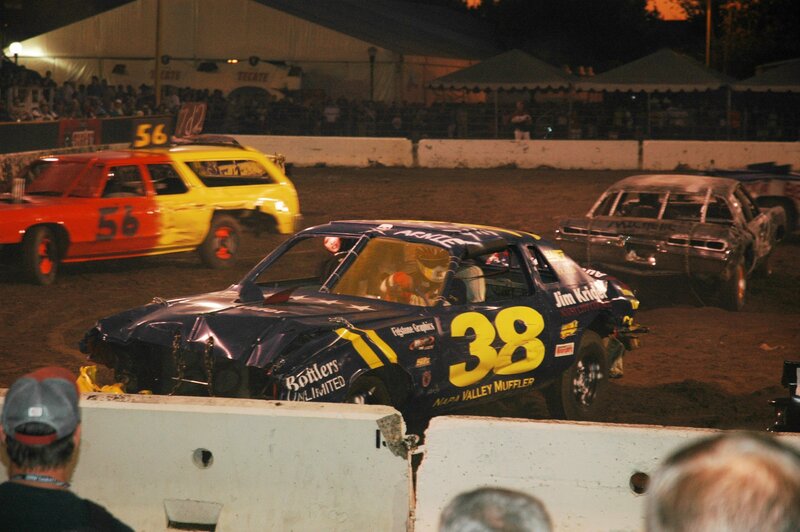 Your car will definitely end its life at the demolition derby. It will not get you to the theatre to watch Fast and the Furious 7 next weekend. Most cars don’t make it through a single heat, let alone multiple events. 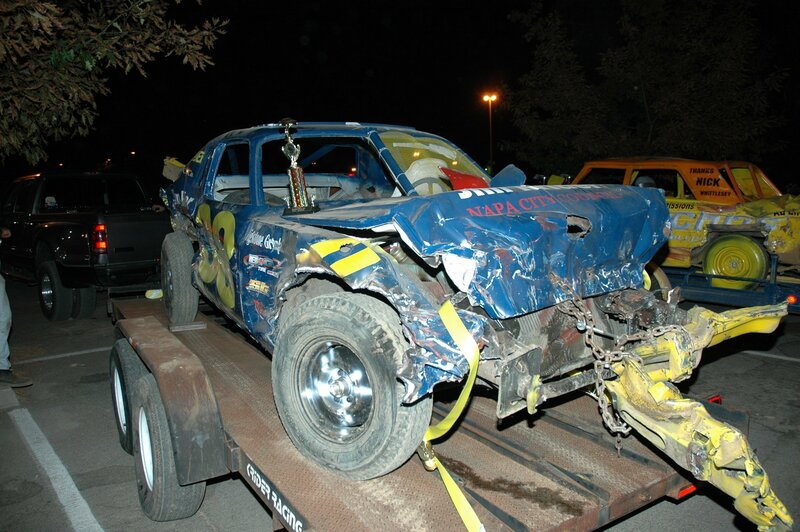 Don’t spend too much time or money on your demo-derby ride since you won’t be using it all season long. If done right, it should last about 20-40 minutes. Best case scenario, you can keep the steering wheel and hang it on your wall when you’re done. Everything else will be a total loss. Once you’re done welding, weld some more and then head to the local county fairgrounds. Before the event, fans will spend their day eating corndogs and throwing up on the Tilt-A-Whirl as they wait for the stadium to open up. The grandstands fill up fast as you tow your car in and pay your registration fee. You’ll sign a waiver that says you won’t sue everyone after you get hurt. You have to go through tech where they check to make sure you haven’t filled your frame with rebar in an attempt to stiffen the chassis. There will be a driver’s meeting where they will explain the rules. The rules are no alcohol, no weapons and no fighting. Everything else is pretty much good to go. You will randomly draw a chip out of a hat which will determine which heat you’re in. You want a lucky draw for an early heat, so you have time to fix your car before the loser round or the main event. Once your heat is called, you drive out into the muddy stadium and park with your trunk facing another competitor across the arena. When the siren blows, it’s on! Hit but don’t get hit. Just like they say in boxing, “jab and move.” Stay away from the edges of the arena, you don’t want to get caught on a log or smashed into a Jersey barrier. Even though it is against the rules, you will get hit in the driver’s door and you will get pissed. Go get the guy who did it to you and hit him hard enough to fold up his hood and break his distributor. If you’re lucky or good (or both), you’ll be one of the last three or so remaining running when the next siren sounds. If you are then you will move onto the main event. If you’re not, you have one more shot to make it into the main through the loser round, that is if you can get your car running again. If you somehow make it to the main, good luck, because that is where the real heavy hitting comes in. Money is on the line. The competition gets serious. These are hands down the absolute toughest people in motorsports. They crash cars into each other on purpose and most don’t even bother to wear the seatbelt while doing it. Some of the people I have competed against were either ex-bullriders, felons or oil rig workers. Some were all three. In the arena, most of these guys would like to see you impaled on their front bumper; however in the pits these guys will do anything to help you. They will weld your car and bang on it with a sludge hammer just to help get you back into the event (so they can try to impale you again). They’re gritty folk, but the kind of people you want on your side in a bar fight. Yes, there will be a bar fight after the event. It’s there to be had. This is a last man standing epic gladiator battle in front of a drunk, screaming crowd. Trophies go out to heat winners (as well as a piece of the purse – yes, cash is there to be won) and the main event winner gets an enormous trophy and a sizable check. Cash is king! You’re a pro driver now. Simple: bring a Chrysler. Use trailer tires with thick sidewalls. Weld, weld, weld, and weld some more of your car making it as solid as possible (within the rules, of course). Run HP 234 friction modifier in your motor and transmission because you will inevitably run the car with no water, no oil and at about 400 degrees at 5,000 RPMs. Metal to metal friction will end your day. Drive the car as if it was somebody else’s body inside it. Score points by hitting tires and don’t lose points by accidentally hitting a competitor’s driver’s door. You need to score enough points in the early rounds to make it to the main event, but at the same time, you have to make your car last all the way until the main event. There is a careful balance between absolute destruction and precise hitting. Believe it or not there is a real art to crashing cars. FUEL (Cost): Fuel gauge is just over half a tank because even though it doesn’t cost too much to do this event, it is still a lot of prep for one singe derby and you will destroy an entire automobile. Plus you’re going to need a tow rig to get your hooptie to the event. You’ll spend more than you intended. RPMs (Adrenaline): The tachometer is at 6,500 RPMs because when you have that uncapped V-8 screaming at redline and you smash head on into another car –you’re alive! MPH (Danger): The speedometer is around 85 mph because, for obvious reasons, you can get hurt. I’ve seen some ugly fires, lots of minor burns from busted radiator hoses (steam is a bad thing –wrap your hoses with duct tape) and some broken arms. This ain’t no sissy sport. I walked away without any permanent scars but a pretty sore neck. VOLTS (Time): The volts gauge is in the mid range because you will spend a fair amount of time prepping the car for its funeral. I spent three solid weekends building a car but only fifteen minutes destroying it. MILEAGE (Car Wear): The mileage is pegged at 999,999 miles because your car won’t see a single mile after the derby. It’s a guaranteed 44 magnum bullet to the head. 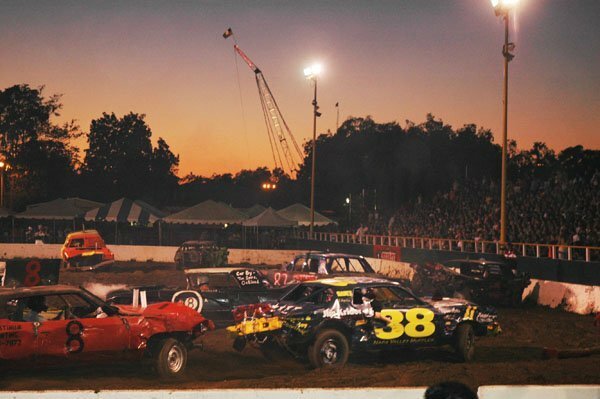 If you want to compete in a event where you can look up in the stands and see a forty-year old woman with a half shirt on, jumping up and down, screaming your car number as she spills Coors Light on the people below her, then I’ll see you at the Destruction Derby.